The lined leather daypack has got a padded laptop compartment in which you can keep your notebook up to 15.6 inches securely. 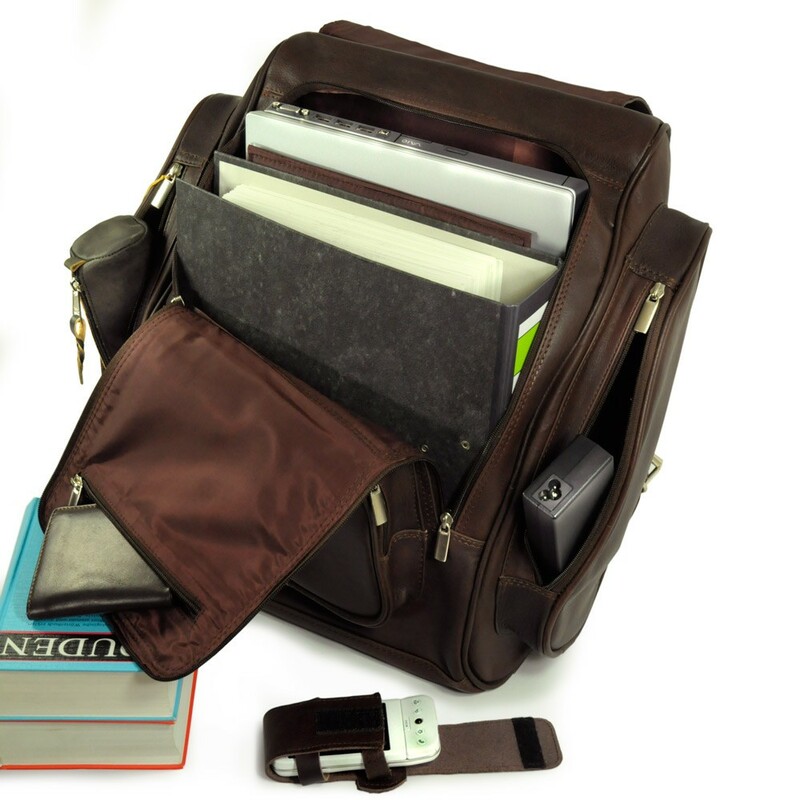 Alongside to a laptop, the chic notebook backpack also fits an A4 folder and other important documents well. You can keep smaller items perfectly in the large outside pockets on the side, the front pocket and in the other zip pockets which are inside the travel pack. ATTENTION: This premium city bag really is very big and is less suitable for petite people. 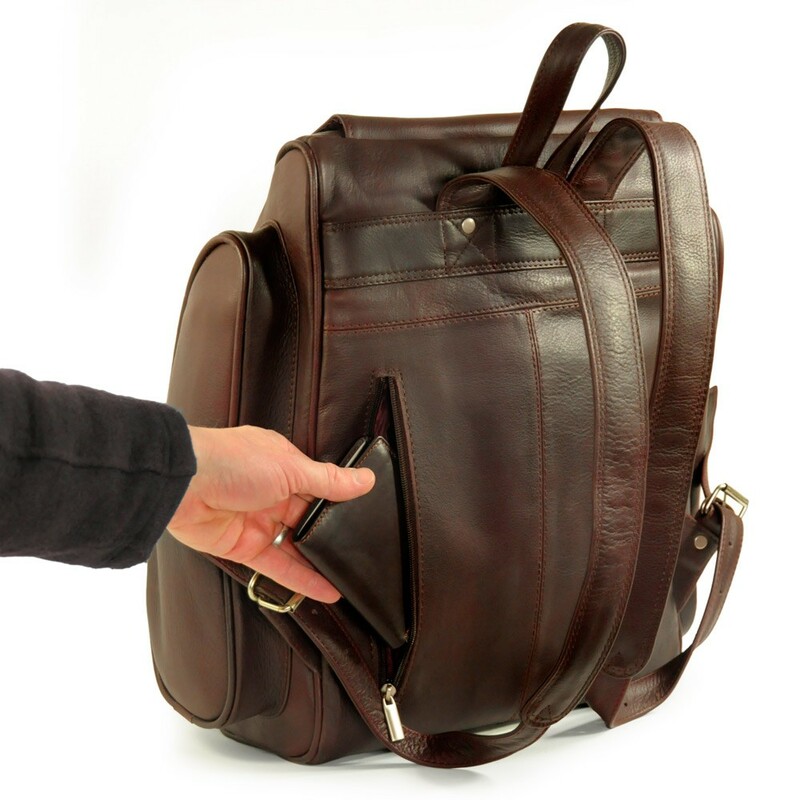 If you prefer this noble leather rucksack of the same design in a more slender version – without outside pockets on the side - please choose model 711 (size L) from our backpacks. The model 710 (size M) is considerably smaller. 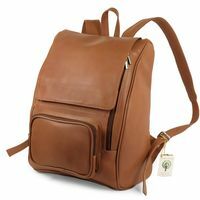 It was the favourite aunt, who gave the explicit assignment for the design of this leather backpack: Travelling a lot, she had bought a similar rucksack in New York a long time ago and was heartbroken when it gave up after 25 years of service. What luck, that her nephew designs leather bags! So through joint tinkering, the ultimate XL city bag was developed for the modern city person, who wants a high-quality, spacious city bag made out of real leather which can fit a lot and yet looks very chic – and does not appear like an arbitrary outdoor pack. Even though that kind of hiking backpack normally can fit a lot, but it definitely belongs outside based on its look. And also due to its features, an outdoor travel pack is way more appropriate for a hike than in the office or at an important business meeting. 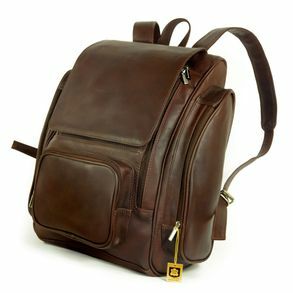 This is not about stowing the camping cooker and sleeping matt as space-saving as possible, but how to fit the laptop, folder and other documents securely and one usually also is required to have a certain business look, so the exclusive Nappa leather certainly is way more appropriate than waterproof nylon. 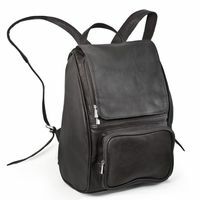 Well enough: the newly designed leather backpack offers a padded laptop compartment with a flexible divider for notebooks up to 15.6 inches. Alongside to a laptop, an A4 folder and other documents also fit well into the chic leather book pack. 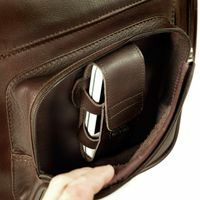 You can keep smaller items best in the outside pockets on the side, in the front pocket with an extra pocket for a mobile phone, in the two zip pockets in the flap and in the outside zip pocket in the back piece. The double-zipper of the large compartment allows you to easily pack and unpack bulky items as well, so that you also always have got a good overview of the spacious city bag’s content. Firstly: The top hand-crafted workmanship and the great quality of the leather assure a long life of this noble travel pack. 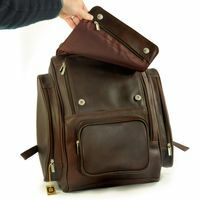 Secondly: The well thought through design of the city bag offers space for a lot of things, which you like to carry with you, whether job-related or private. And thirdly: The elegant design definitely makes sure that you will always look good with this high quality leather daypack, no matter for which occasion. 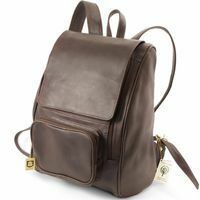 You will see – you will be completely satisfied with this first-class premium rucksack and will enjoy it for a ling time! 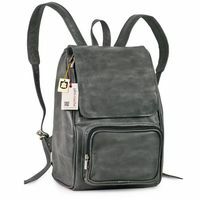 Please notice the dimensions: This backpack really is very large and is less suitable for petite people – the model 711 (no side pockets, size L) or model 710 (no side pockets, size M) offer a smaller version.